In adult spinal deformity (ASD), sagittal imbalance and sagittal malalignment have been extensively described in the literature during the past decade, whereas coronal imbalance and coronal malalignment (CM) have been given little attention. CM can cause severe impairment in adult scoliosis and ASD patients, as compensatory mechanisms are limited. 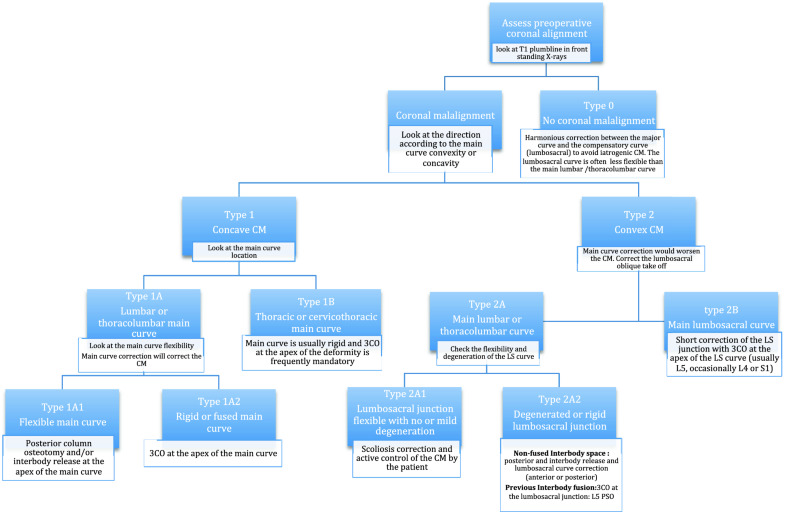 The aim of this paper is to develop a comprehensive classification of coronal spinopelvic malalignment and to suggest a treatment algorithm for this condition. This is an expert’s opinion consensus based on a retrospective review of CM cases where different patterns of CM were identified, in addition to treatment modifiers. After the identification of the subgroups for each category, surgical planning for each subgroup could be specified. Two main CM patterns were defined: concave CM (type 1) and convex CM (type 2), and the following modifiers were identified as potentially influencing the choice of surgical strategy: stiffness of the main coronal curve, coronal mobility of the lumbosacral junction and degeneration of the lumbosacral junction. A surgical algorithm was proposed to deal with each situation combining the different patterns and their modifiers. Coronal malalignment is a frequent condition, usually associated to sagittal malalignment, but it is often misunderstood. Its classification should help the spine surgeon to better understand the full spinal alignment of ASD patients. In concave CM, the correction should be obtained at the apex of the main curve. In convex CM, the correction should be obtained at the lumbosacral junction. The online version of this article ( https://doi.org/10.1007/s00586-018-5826-3) contains supplementary material, which is available to authorized users. Coronal malalignment (CM) is defined as lateral deviation of the T1 plumbline with substantial displacement from the midline of the pelvis for more than 20 mm. CM has also been referred to in the literature as coronal imbalance [1, 2, 3], but balance is obviously a dynamic concept, and our spinal assessment is done on full spine X-rays that are static and not dynamic examinations; therefore, balance or imbalance should rather be called alignment or malalignment. CM is evaluated in standing position in ambulatory patients and in sitting position in patients who are not able to walk, and it has been well documented and analyzed in patients with cerebral palsy [4, 5]. In this clinical situation, CM (originating from spinal deformity) causes pelvic obliquity which leads to gait disturbances in patients who are able to walk, and to asymmetric ischial compression in sitting position and difficulties to maintain proper sitting position in patients who are not able to walk. Pelvic obliquity can also lead to costo-iliac conflict and costal pain. In patients suffering from adult spine deformity (ASD), CM has been rarely described and the literature provides little guidance for surgical indications [6, 7]. Nevertheless, CM (or coronal trunk inclination CTI) is regularly seen in patients with ASD who have undergone or not undergone surgery. Patients suffering from CM do not have many compensatory mechanisms available for this specific condition. The only natural compensatory mechanism is contralateral knee and hip flexion, which is extremely uncomfortable for the patient. In addition, unlike the sagittal malalignment (SM), which disappears in sitting position, coronal malalignment is present in sitting and standing position and is irrelevant only with the patient laying down horizontal. Consequences of CM on patient’s satisfaction are not neglectable, especially when it appears or worsens after the surgery. CM is rarely isolated and it is frequently associated to sagittal plane deformities and SM . Surgical correction of sagittal and coronal malalignment needs biplanar maneuvers, which may be challenging and may need different kinds of osteotomies [9, 10]. The aim of this paper is to develop a comprehensive classification of coronal spinopelvic malalignment and to suggest a treatment algorithm for this condition. Type of study Expert’s opinion consensus and case studies. Methods A collection of cases with a variety of CM scenarios was restrospectively obtained from the authors’ centers surgical files. Cases representing categories of CM patterns were selected. The relevant factors (treatment modifiers) influencing surgical planning and execution and their effect on surgical outcomes in terms of alignment were defined. Subsequently, categories of CM and modifiers were listed. Finally for each pattern and relevant factors, the most appropriate indications for planning and surgical execution were assigned. Curve flexibility was assessed by supine bending films in the majority of cases unless the lumbosacral curve was stiff, in that case fulcrum-bending test (with bolster) in lateral position with horizontal beam were performed. A specific concern was to evaluate L4 endplate obliquity on bending films. The flexibility of the curve should be modulated by the possibility of obtaining some interbody mobility by posterior or anterior release. This will cause some rigid curves to potentially become flexible and that may avoid performing three-column osteotomy (3-CO). To evaluate sagittal plane flexibility, bolster extension lateral film was obtained. In addition, MRI and CT scans were systematically performed to evaluate the degeneration of the lumbosacral junction as well as the canal caliber. Two main CM patterns were identified. The relevance of these patterns depends on the different effects that correction of the main coronal curve has on each pattern. In the case of concave CM, correction of the main curve is coupled with reduction in CM. Conversely, correction of the main curve in convex CM results in increase in CM. 1.Type 1: Concave coronal malalignmentIn concave CM, the correction of the main curve improves the CM, thus we can talk about convergent corrective objectives. The ability to correct the CM depends on the correctability of the main curve. The need of three-column osteotomies in order to obtain correction of CM depends on the location and flexibility of the main curve. 1.a.Type 1A: Main lumbar/thoracolumbar curveThe correction strategy will depend on the flexibility of the main curve. 2.Type 2: Convex coronal malalignmentConvex CM is defined by a deviation of the trunk on the convex side of the main coronal curve, which usually is a lumbar (apex below L1 and above L4), thoracolumbar (apex at T12 or L1) or lumbosacral main curve (apex at or below L4). The correction of the lumbar curve will increase the CM by creating a straight spine based on an oblique takeoff, and we talk about divergent corrective objectives. Many specific subtypes can be identified; all of them have in common an oblique takeoff at the lumbosacral junction. The correction of convex CM depends on the correction of the lumbosacral curve. The primary curve may be lumbar or thoracolumbar (more frequent situation) with compensatory lumbosacral fractional curve, but sometimes (congenital, iatrogenic, post-traumatic and rarely degenerative) it can be lumbosacral with compensatory lumbar curve. The correction strategy will depend on many factors including the driver of the deformity, which should always be fused, but also the degeneration and stiffness of the compensatory curve which can lead to more extended fusion. The need of three-column osteotomies depends mainly on the stiffness of the lumbosacral curve. 2.a.Type 2A: Main lumbar or thoracolumbar curveWhen surgery is indicated, the correction of the main curve will increase the coronal malalignment. The correction strategy will depend on the characteristics of the lumbosacral segment. CM can be the consequence of extraspinal disease such as hip or knee contractures, lower limb length discrepancy, severe deformity of the lower limbs, deformity of the pelvis or neurological conditions such as Parkinson’s disease or Pisa syndrome . Extraspinal causes of CM are out of the scope of this article. More generally, CM is usually (but not always) associated to scoliotic deformity of the lumbar spine, and SM is frequently seen in association with CM. In recent years, ASD has received substantial attention by clinicians and researchers, but most of this attention has focused on various aspects of sagittal alignment. One possible explanation is the fact that while some early research showed associations between both CM and SM with health-related quality of life (HRQoL) , other influential studies did not find substantial correlation of CM with HRQoL . In this scenario, correction of SM has received substantial attention in the literature , and rules for very precise calculation of the amount of correction needed in the sagittal plane are widely available [18, 19]. In spite of this little attention in the literature, CM may cause severe impairment of the function, alteration of self-image and pain due to costo-iliac conflict, and it is the experience of the authors that moderate grades of CM are poorly tolerated by many patients, especially in the presence of a fused spine or in association with SM. Moreover, surgery for ASD frequently fails to correct CM or even worsens it. Bao et al. have found that patients with preoperative convex CM are at higher risk of postoperative persistence or worsening of CM. Ploumis et al. in a retrospective analysis of 54 patients followed-up for 2–5 years after long fusions for ASD found that while sagittal malalignment was consistently reduced by surgery, the prevalence of CM did not change from the preoperative to the early postoperative period. In nearly 60% of the cases, preoperative CM was not corrected by surgery, and nearly 9% of patients without preoperative CM showed new onset of CM early postoperatively. Moreover, additional 18% of patients without early postoperative CM developed new CM during follow-up. Postoperative convex coronal malalignment has been described after fusions with the lowest instrumented vertebra (LIV) at L5 for lumbar scoliosis with the use of transpsoas lateral cages, and the likely mechanism is overcorrection of the main lumbar curve over a stiff L5–S1 segment that cannot correct spontaneously to achieve a horizontal takeoff . The clinical importance of these phenomena has been shown by Koller et al. , who in a retrospective study on 448 patients found that postoperative CM was associated to worse postoperative clinical outcomes in patients undergoing surgery for ASD. We hypothesize that the difficulties to correct CM or to maintain coronal alignment when performing surgery for ASD is due to the lack in the literature of clear rules on how to manage or avoid CM. The study of Bao et al. shows the importance of distinguishing convex from concave CM. This separation between concave and convex CM is essential because of its treatment consequences. The correction of the main curve improves concave CM but worsens convex CM as it has been shown in the examples. Surgeons focusing on correcting the main lumbar curve without paying attention to the pattern of CM and the difference in stiffness between the L/TL and the fractional LS curve can actually induce postoperative CM. In this article, we provide guidelines that help the clinician to identify the key factors (patterns and modifiers) and effective strategies of prevention and correction of CM. Classifications allow us to identify patterns or categories with different causes, behaviors, needs or prognosis. In the field of ASD, different classifications have been described and they provide different types of information. An early classification of ASD by Aebi  informed only on the causes of the deformity. Schwab et al. proposed a new classification with metric validation. Though the latter provided information on the impact of the deformity on HRQoL, neither of these classifications provided guidance to treatment. In 2014, two treatment-oriented classification systems were proposed. The first is by Berjano, aimed to provide guidance to the selection of fusion levels and techniques in adult patients with degenerated or degenerative lumbar deformities . The second is by Lamartina, provided a comprehensive, validated anatomical classification of sagittal deformities, which contained specific suggestions regarding the site of correction and extension of the instrumentation . The current classification of CM comes in the “treatment-oriented flavor” too, as a guide to assist clinicians to obtain better clinical outcomes. The main weakness of this study is its non-experimental design. Experimental studies have provided some useful insight into the phenomenon of CM. As an example, Bao et al. have shown that postoperative coronal imbalance can improve spontaneously and that lower instrumented vertebra at L4 or higher is correlated to a higher chance of spontaneous correction, which is in agreement with our suggestions. Yet, the complexity of the problem, associated to the multiple variations found (in this classification scheme, we have identified at least six different combinations of patterns and modifiers), makes it virtually impossible to provide a treatment-oriented system based only on experimental data. This article summarizes substantial expertise from the authors, which subsequently will be validated as a whole system in a future paper.A simplified algorithm for management and prevention of CM is provided in Fig. 22. Coronal malalignment is a frequent situation, both in non-operated ASD patients and as a new onset deformity in patients operated for ASD that is often misunderstood. It is usually associated to SM. The direction of the coronal malalignment should be described in relation to the main curve of the deformity. In concave coronal malalignment (Type 1), the correction should be obtained at the apex of the main curve; the need of 3-CO depends on its flexibility. In convex and convex-like coronal malalignment (Type 2), the correction should be obtained at the lumbosacral junction. In coronally aligned spine (type 0), to avoid postoperative new onset of CM, hypercorrection of the main lumbar curve should be avoided.